Stranded knitting has a special effect on me – no matter how torturous the knitting (I called this project “hellish” the last time I wrote about it), I love the end result! When thinking about my favorite knitted projects over the years, I instantly think of the mismatched Fair Isle knee highs, for instance. And so with the Deer Dress: after all is said and done, love, love, LOVE!!! Pattern: Deer Dress by Signe S. Simonsen. Yarn: red is Dale of Norway Baby Ull, #4227, 3.5 skeins; white is Dale of Norway Baby Ull, #0020, less than 1 skein; navy is Lanett Superwash, #5575, less than 1 skein. Needles: US 1.5, 2.50mm circs. Sizing, gauge, etc. 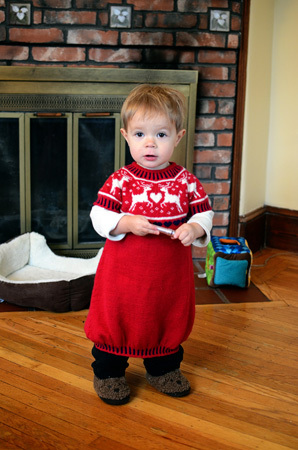 : I worked the second smallest size, 1.5-2.5 years, and the dress came out to be 21″ around the chest and 19.5″ shoulder to hem after blocking. I steam blocked using my steamer, by the way. As always, my gauge varied drastically between plain stockinette and stranded knitting. Plain stockinette: about 7 stitches and 9.5 rounds per inch. Stranded knitting: about 9 stitches and 11 rounds per inch. 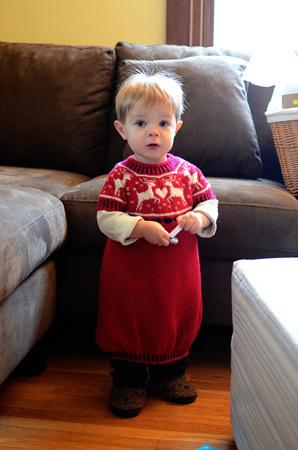 I failed to accommodate for my very tight stranded knitting, and as a result, the chest came out quite small/tight and the dress fits a child much smaller than a typical1.5-2.5 year old. The pattern made some provisions for the differences in tension between stockinette and stranded stockinette, but I think I needed to compensate even more. Nonetheless, the end result should fit the recipient, and overall I’m super pleased with how it came out! Corrugated ribbing pretty much is the devil, but it looks so pretty when it’s done. Oh. My. Goodness. I don’t think even the most jaded, bored, blank eyed teenager could be blackmailed by these pictures. They are just too freaking adorable. Your model is working it! Look who’s standing up so straight and tall! The dress is adorable, and the model even more so! I love corrugated ribbing personally, but I’ve only done it in the round. Back and forth doesn’t sound like fun at all. 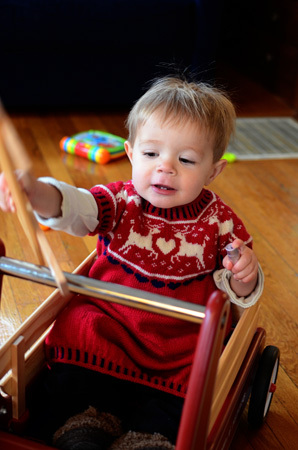 You make beautiful things, children especially! I recently completed my first stranded project (Celtic owl hat) and found the process so tedious. Props to you for knitting a stranded dress! It looks great spesh on your little guy! The dress is adorable. I love stranded work, so I might have to add this to the things to make for my SIL who is expecting! Gah! The dress is amazing, and moreso with your good sport model! Love! Wow. That turned out fabulously. I don’t know what you did to carry the red behind the white, but I sure can’t see it! Nice job (as usual). With stranded knitting, what ended up working for me was-how to describe it- knitting the item inside out, using the needles on the far side of the tube instead of those on the near side. The floats of the stranded work go around the outside of the knitting and not the inside, so they stay longer. You just have to play with it to see what I mean…….but it made a HUGE difference in my tension!!!! Adorable! 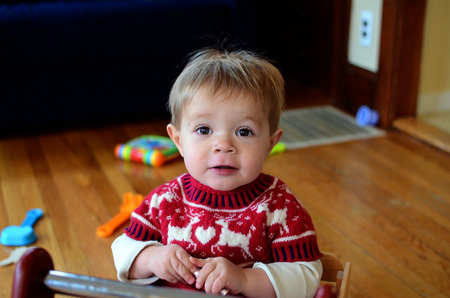 Wee Gregory needs a matching deer sweater, I think. Love that little dress!! 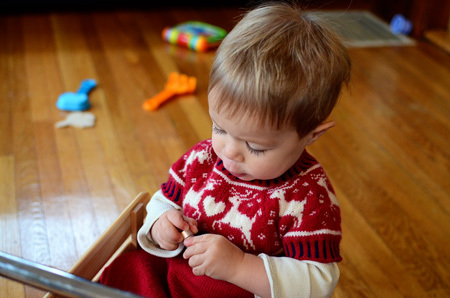 I use Baby Ull a lot in my kids knitting…. and have a fabulous source for it…. but where can I get an adorable, beautiful model like yours? He’s gorgeous. there is always a big difference when part of a garment is stranded and part is not. you could try going up a needle size (or two)for the stranded knitting sections.